The amplifier and speaker connections are shown in the wiring diagram. Left and Right circuits are separated so make sure to use the correct terminals for proper operation. Each speaker selector selects the A or B amplifier independently. To avoid operational errors or damage to the equipment, make sure that all channels are connected correctly. The DSSV6-150W has 6 independent sets of A or B switch selections, if the switch is in the down position B is selected and if the switch is in the outward position A is selected. There are also 6 sets of ON/OFF function selectors that are independent. Pressing the selector in the down position selects ON and releasing it to the outward positions selects OFF. There are 6 controls for the audio level. Remember the DSSV6-150W has an automatic impedance compatible design and will correct input regardless of combination selected. The speaker selector provides an advanced manual-selectable impedance compatible design and acoustical high quality system. Either 4 Ohm or 8 Ohm speakers can manually match any configuration. All speaker impedances are matched which prevents over heating of the amplifier when multiple speakers are connected to the amplifier at the same time. It is important to follow the impedance selector for 1,2,3/4 & 5/6 pairs for the number speaker pairs used. NOTE: The factory default setting for the impedance pair selector is positioned at the highest value, but the number should be selected accurately in accordance with the quantity of the speaker pairs that have been connected to the DSSV6-150W. The speaker selector has 2 independent amplifier inputs A and B that can be selected for each room. The speaker selector has ON/OFF switching functions for each room that can be controlled from the front panel of the unit. 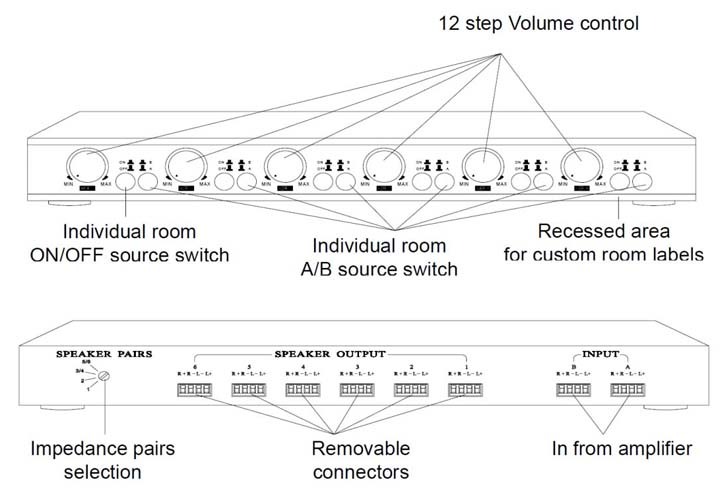 The speaker selector volume control has 12 steps of attenuation as shown below. NOTE: Avoid damage caused by improper volume setting. The amplifier should be at its lowest volume level and the selector at the highest volume level. Slowly adjust the amplifier volume to an acceptable level without clipping or distortion.